Vice President-elect Joseph R. Biden Jr. sees his role in Barack Obama‘s administration as “adviser in chief,” using his decades of experience in the Senate to offer the president candid input on domestic and foreign policy issues, according to Biden aides. 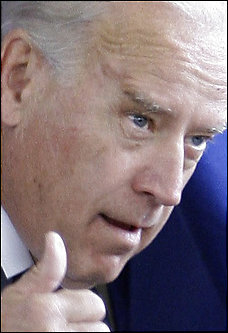 Sen. Joseph R. Biden Jr. But Biden, a twice-failed presidential candidate, will not use the post in a way many vice presidents have: to make a play for the Oval Office. He has said publicly that he does not intend to run for the presidency again. Although Vice President Cheney has performed a similar role in the Bush administration, advising the president on key issues, meeting with congressional leaders and eschewing his own presidential run, Biden intends to operate differently. In the vice presidential debate last month, Biden called Cheney “the most dangerous vice president we’ve had probably in American history,” and he has criticized Cheney for excessive secrecy and holding too much power in the Bush White House. Biden aides said the senator from Delaware does not intend to take on a defining issue, as Al Gore sought to do with his “reinventing government” initiative, which aimed to improve the efficiency of the federal bureaucracy. Biden’s team says such a project distracts from a vice president’s ability to serve as a general adviser to the president. Instead, they said, he is likely to take on special projects. They cited as an example Gore’s work in the Clinton administration in helping negotiate an agreement with the Russian government to stop it from selling weapons to Iran. You are currently browsing the archives for the advosor in chief category.